Increased intracranial pressure is a rise in the pressure inside the skull that can result from or cause brain injury. is the pressure in the skull that results from the volume of three essential components: cerebrospinal fluid (CSF), intracranial blood volume and central nervous system tissue. The normal intracranial pressure is between 5-15 mmHg. This is slightly lower than the mean systemic arterial pressure but considerably higher than venous pressure. The intact cranium is essentially inexpandable containing about 1400 grams of central nervous system (CNS) or brain tissue, 75 ml of blood and about 75 ml of cerebrospinal fluid (CSF). These three components of the cranial vault maintain a state of equilibrium. Their pressure and volume determine the condition of balance. According to Monro-Kellie hypothesis, any increase in one of these elements must be balanced or compensated by a proportional constriction either or both of the other two components such as decreasing the volume of cerebral blood flow, shifting CSF flow (into the spinal canal) or increasing CSF absorption. Absence of these compensatory changes results to increased intracranial pressure. 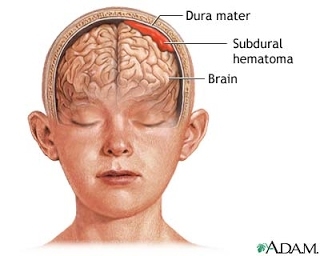 Once ICP reaches around 25 mmHg marked elevation in intracranial pressure will be noted.Increased intracranial pressure is a rise in the pressure inside the skull that can result from or cause brain injury. In addition to the above, if mass effect is present with resulting displacement of brain tissue, additional signs may include pupillary dilatation, abducens palsies, and the Cushing’s triad. Cushing’s triad involves an increased systolic blood pressure, a widened pulse pressure, bradycardia, and an abnormal respiratory pattern.In children, a low heart rate is especially suggestive of high ICP. Irregular respirations occur when injury to parts of the brain interfere with the respiratory drive. Cheyne–Stokes respiration, in which breathing is rapid for a period and then absent for a period, occurs because of injury to the cerebral hemispheres or diencephalon. Hyperventilation can occur when the brain stem or tegmentum is damaged. A very common treatment for long-term, especially idiopathic, cranial hypertension is medication with a special diuretic, especially one prescribed by a neurologist. In patients who have high ICP due to an acute injury it is particularly important to ensure adequate airway, breathing, and oxygenation. Inadequate blood oxygen levels (hypoxia) or excessively high carbon dioxide levels (hypercapnia) cause cerebral blood vessels to dilate, increasing the flow of blood to the brain and causing the ICP to rise.Inadequate oxygenation also forces brain cells to produce energy using anaerobic metabolism, which produces lactic acid and lowers pH, also dilating blood vessels and exacerbating the problem.Conversely, blood vessels constrict when carbon dioxide levels are below normal, so hyperventilating a patient with a ventilator or bag valve mask can temporarily reduce ICP. Hyperventilation was formerly a part of the standard treatment of traumatic brain injuries, but the induced constriction of blood vessels limits blood flow to the brain at a time when the brain may already be ischemic—hence it is no longer widely used. Furthermore, the brain adjusts to the new level of carbon dioxide after 48 to 72 hours of hyperventilation, which could cause the vessels to rapidly dilate if carbon-dioxide levels were returned to normal too quickly.Hyperventilation is still used if ICP is resistant to other methods of control, or there are signs of brain herniation because the damage herniation can cause is so severe that it may be worthwhile to constrict blood vessels even if doing so reduces blood flow. ICP can also be lowered by raising the head of the bed, improving venous drainage. A side effect of this is that it could lower pressure of blood to the head, resulting in a reduced and possibly inadequate blood supply to the brain. Venous drainage may also be impeded by external factors such as hard collars to immobilize the neck in trauma patients, and this may also increase the ICP. Sandbags may be used to further limit neck movement. In the hospital, the blood pressure can be artificially increased in order to increase CPP, increase perfusion, oxygenate tissues, remove wastes and thereby lessen swelling. [Since hypertension is the body’s way of forcing blood into the brain, medical professionals do not normally interfere with it when it is found in a patient with a head injury. When it is necessary to decrease cerebral blood flow, MAP can be lowered using common antihypertensive agents such as calcium channel blockers.If there is an intact blood–brain barrier, osmotherapy may be carried out by administering IV mannitol to create a hypertonic solution within the blood to draw water out of the neurons. This helps to reduce the fluid within the intracranial space, however prolonged administration may lead to increase in ICP. Intracranial pressure can be measured continuously with intracranial transducers. A catheter can be surgically inserted into one of the brain’s lateral ventricles and can be used to drain CSF (cerebrospinal fluid) in order to decrease ICP’s. This type of drain is known as an EVD (extraventricular drain).In rare situations when only small amounts of CSF are to be drained to reduce ICP’s, drainage of CSF via lumbar puncture can be used as a treatment. There are many clinical studies of non-invasive intracranial pressure measurement methods currently being proposed, aimed to find reliable and accurate way to measure ICP non-invasively. Such method could improve diagnostics of traumatic brain injury and many other conditions associated with intracranial hypertension. Craniotomies are holes drilled in the skull to remove intracranial hematomas or relieve pressure from parts of the brain.As raised ICP’s may be caused by the presence of a mass, removal of this via craniotomy will decrease raised ICP’s. A drastic treatment for increased ICP is decompressive craniectomy, in which a part of the skull is removed and the dura mater is expanded to allow the brain to swell without crushing it or causing herniation.The section of bone removed, known as a bone flap, can be stored in the patient’s abdomen and recited back to complete the skull once the acute cause of raised ICP’s has resolved. Alternatively a synthetic material may be used to replace the removed bone section.